Home » Investment Opportunities » Is Microsoft the Next $1 Trillion Company? Is Microsoft the Next $1 Trillion Company? The first PC in my house growing up was an Apple IIc. At the time, it was revolutionary. I learned to program Beginners’ All-Purpose Symbolic Instruction Code, also known as BASIC, for the simple purpose of playing video games. I saved those programs on a 5-1/4-inch floppy drive. But I didn’t really use a computer for anything serious until my high school years when my family bought its first Windows-based machine. Aside from a few gadgets here and there — the iPod comes to mind — Microsoft Corp. (Nasdaq: MSFT) has always been “what’s next” in both my personal and professional life. “Be What’s Next” was Microsoft’s slogan around 2010, and it has always seemed to fit the company rather well … with a few exceptions here and there, like Windows ME and the Zune media player. For investors, those few exceptions were hard to swallow. Microsoft has long been accused of not innovating fast enough, missing out on the mobile software boom and a broad swath of the innovation near the birth of the internet. Apple, on the other hand, has relished in both. The company rose to its current heights on the back of the mobile market, first with the iPod and then the iPhone. It seemed that Microsoft, like many other founders of modern technology, would become a dinosaur — oh, Xerox, what could have been? Unlike the Xeroxes and IBMs of the world, however, Microsoft has not lost its relevance. The company is thriving to such a degree that it briefly overtook Apple as the largest U.S. company by market capitalization last week. It begs the question: Can Microsoft truly be a $1 trillion company? If I were to ask an audience of investors which tech stock they’d buy on a dip in the current market, I’d likely get a loud chorus of: Apple! As my colleagues and I have noted several times over the past year, there are some very concerning issues with Apple, beginning with how the company achieved its brief $1 trillion valuation in the first place. My response to that same question would be Microsoft. Contrary to popular belief, Microsoft is not a dying company. The Windows operating system and desktop-based Office software is not all the company makes. It has spent the past several years transitioning into the cloud, and it has paid off handsomely. Microsoft Office is now a subscription-based service in the cloud and can be bundled with Microsoft’s Azure. If you don’t know Azure yet, it’s a computing service for building, testing, deploying and managing business applications and services. The important thing to know about Azure is that it is a central part of Microsoft’s growing $20 billion cloud computing division. What’s more, Azure has seen astounding growth, with revenue soaring 75% in the first quarter of fiscal 2019. And while Amazon Web Services (AWS) still outstrips Azure on a revenue basis, AWS only saw growth of about 24% for the same period. In short, Azure is a quickly rising No. 2 in the cloud services market. Furthermore, while Microsoft missed the mobile craze, it has made the company stronger as a result. Unlike Apple, Microsoft doesn’t rely on mobile handset sales for revenue. The company has instead focused on its hybrid tablet/PC device, the Surface. And while mobile phone sales have tanked in the past two years, Surface sales continue to rise, with revenue growing 14% in the most recent quarter. This is Microsoft’s future: The combination of mobile computing via the Surface and mobile business cloud computing with Azure. In a way, it’s similar to Alphabet’s Google Cloud and Chromebook offerings. However, Microsoft doesn’t rely on selling ads to power its revenue juggernaut. As we’ve seen this year, privacy concerns and government intervention can seriously hamper the ad revenue model, while Microsoft’s subscription model has no such limitations. Let’s face it: Investing in tech right now is a gamble. The former market-leading FAANG stocks (Facebook, Apple, Amazon, Netflix and Alphabet, the parent of Google) and semiconductor stocks have lost their momentum, leading to contagion throughout the tech sector. But Microsoft is neither a FAANG nor a chip stock. It’s a blue-chip business software services company. One with a long history of surviving the worst the market can throw at it … including the dot-com bust, the 2008 financial crisis and several antitrust lawsuits, both in the U.S. and abroad. Right now, MSFT stock is riding a rebound in tech stocks. The shares bounced convincingly off support near $100 last month, and are now perched above their 50-day simple moving average. What’s more, Microsoft’s 14-day Relative Strength Index is rising, which is something few tech stocks can boast right now. A pullback to the $110 area looks like a solid entry point if tech-sector strength holds. Whether or not this sector strength will last depends largely on external factors (like trade policy and presidential tweets, of all things). 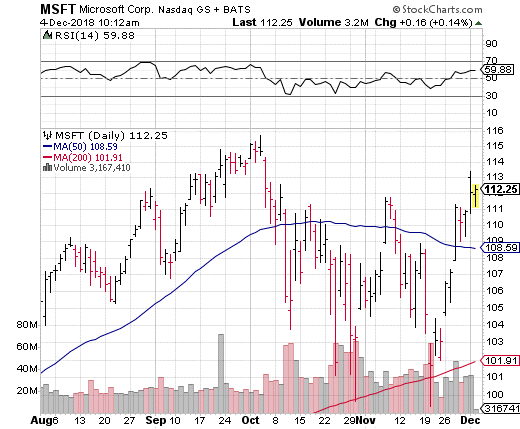 That said, MSFT stock is one of the few tech stocks that is worth buying in a market dip. The company has impressive future growth prospects that are not tied to tariffs or are largely dependent on foreign trade policy. As such, Microsoft is an excellent long-term investment that gives your portfolio exposure to a volatile tech sector with much less volatility. And, as my colleague Ted Bauman always says in The Bauman Letter, low-volatility investing is the key to surviving whatever the market throws at you. Is Apple’s Dip a Buying Opportunity?